Debenhams Ashford are the first team to get on their bikes and ride as part of Pilgrims Hospices My 10, Any 10 challenge. 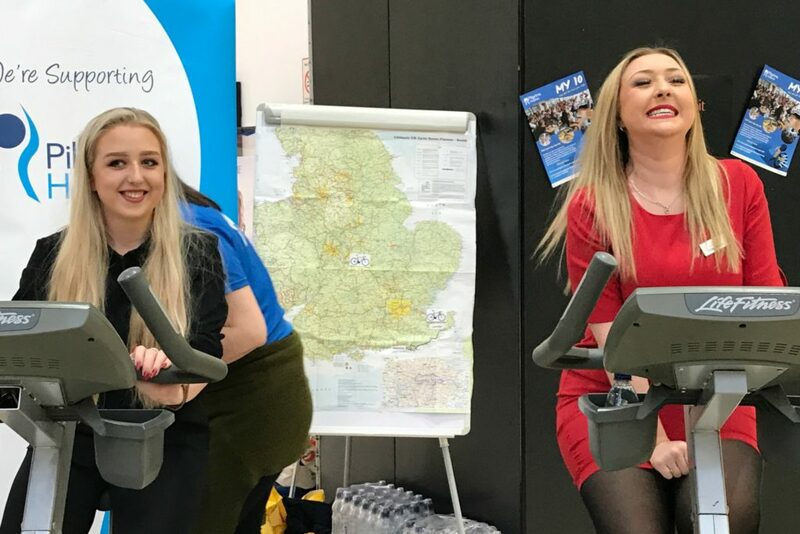 A team of 30 staff came together to support Pilgrims Hospices on Friday 5 and Saturday 6 April by getting on their bikes in the County Square store. The team surpassed their own plans, riding a virtual distance of 300 miles from Ashford to Liverpool as part of Pilgrims’ new My 10, Any 10 challenge. The team of all ages and abilities took turns of 10-30 minutes each to cycle for over five hours in total on two static bikes. The cycling contingent had planned to cycle to Brighton and to do 10 miles or km at a time, but the miles kept coming and the tired legs kept pedalling, so the team decided their end would be Liverpool instead. Amanda Bancroft, one of the organisers from Debenhams, said: “We have chosen to support Pilgrims as it is a charity very close to our hearts, after a member of staff was cared for at the hospice in Ashford. As a store we chose to take part in the My 10, Any 10 challenge to help raise much needed funds for Pilgrims. “We took on the challenge of cycling the distance from Ashford to Brighton in store over two days but had so much fun that we ended up cycling the distance to Liverpool instead! We would like to say a big thank you to all of our staff and customers who supported us over the weekend, helping to raise a fantastic £1,000. “A special thank you to the Park Club Gym in Ashford for loaning the two bikes, Water Direct who kindly donated bottles of water and the Debenhams Beauty Houses for donating prizes for the raffle, including a voucher from Longacres. My 10, Any 10 is an inclusive challenge for people of all ages to set themselves the target of achieving 10 of something. This may be 10 circuits of a school field, 10 miles on a bike, a 10-hour static cycle, a 10km swim completed over several sessions in a pool, or it could be doing something 10 times to celebrate 10 years of Pilgrims’ Cycle Challenge. My 10, Any 10 participants can either raise sponsorship for their chosen 10 or ask people to pay to take part in a group activity. Every pound raised will go towards the care of people living with incurable illness, and their families, here in east Kent. Visit pilgrimshospices.org/my10 for more information or call 07594 083 413. This May the Pilgrims Hospices Cycle Challenge reaches 10 years of pedal power for Pilgrims. By taking part in the My 10, Any 10 and the Cycle Challenge you will be making a real difference to the lives of thousands of local people living with an incurable illness. Every pedal turned and pound raised will help support our patients; making them comfortable, alleviating pain and enabling them to make the most of the time they have. With your help we can continue to be there for the next family who needs us. You can find information on how to register to take part at pilgrimshosices.org/cyclechallenge, by calling 01227 812 609 or emailing fundraising@pilgrimshospices.org. If you or someone you know is coping with a life limiting illness and you think you may benefit from Pilgrims free services, talk to your GP or Healthcare Professional about your options or click here to read about our Wellbeing and Social Programme. The post Debenhams Ashford team pedal to Liverpool and beyond for Pilgrims appeared first on Pilgrims Hospices.